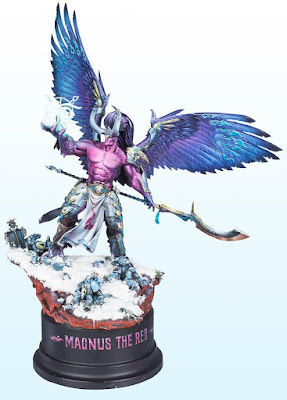 Magnus the Red is a pretty awesome model to start with, and when you give it a literal Golden Demon winning paint job it gets even better. The conversion work that stands out the most is the magical glyph floating above his outstretched hand. This is a really cool addition and definitely drives hime the magical, and mystical aspect of him. The fact that it's not a searing ball of energy or some kind of flame, but rather a symbol of sorts reinforces the scholarly nature of Magnus. 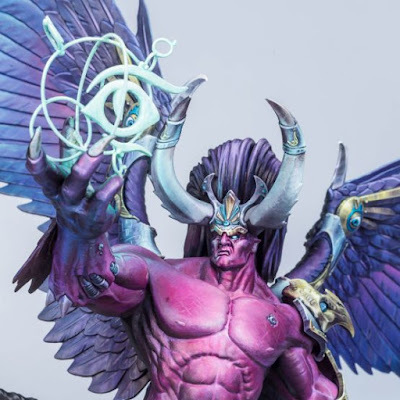 Yes, he's a psyker of unmatched power, but he's always been more interested in knowledge than battlefield dominance. Speaking of battlefield dominance though, the base littered with dead Space Wolves is also very fitting for him, and does a great job of setting him in a definitive time and space. The painting on this is superb as well, as you would expect from a gold winning Golden Demon entry. Not only is everything crisp and smooth, but the colors are amazing. I really love how he went for a purple and blue tone to almost everything, but leaning towards a more pale tint. It gives it a very mystical vibe, and for me, a very 80s one as well. There's just something about those colors that makes me think of that decade. It was the same with the cover of the third edition Eldar codex. It seems to be painted in a more naturalistic style too, with his skin looks particularly realistic, despite being an otherworldly color. The lighting on it is top notch as well. He even tied the name painted on the plinth into the colors of the model. This is a great model all around. Be sure to check out more views of the model on the Official Golden Demon Website and show the artist some love if you like it.